Budget: $2.5 million Timeline: March – August 2017 A feasibility study for the aging Ice Arena was conducted including options for renovation and/or construction. 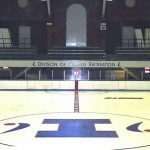 The Ice Arena opened in 1931 with the last major renovations taking place over 25 years ago. Taking all into consideration, the best solution is to utilize a new refrigeration system and ice mat. These will be installed until campus can determine the next steps with the goal of a new facility or larger renovation. 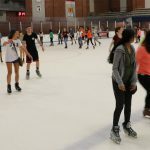 Ultimately, the project will cost $2.5 million and will include a new refrigeration system to be installed on the roof of the Zamboni room, new ice mat and new rubber flooring around the rink. 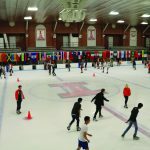 The project is being funded solely by Campus Recreation as we have set aside money over the course of the last few years knowing this would be a need to address. The ice floor dimensions will return to the same currently present. The new refrigeration system is much more efficient and has an 8-10 year life expectancy. The new ice mat contains all piping and could be moved if need be. A new dasherboard system will be installed as well as updated lobby lighting and flooring. Budget: $200,000 Timeline: March – August 2017 The climbing wall, indoor pool, front desk and multi-purpose rooms at the ARC are getting sound system upgrades that are more energy efficient and connect to the main system at the front desk. Neither the pool or the climbing wall were previously connected to the main sound system at the front desk. This enhances communication, risk management, and emergency procedures. We will eliminate the use of sound carts in the ARC Multipurpose rooms 1, 2, 4 and 5 as well as both multipurpose rooms at CRCE. The sound system, with Bluetooth capability will be connected to a wall in each multipurpose room with upgraded speakers to provide better sound quality. This also allows for use of cordless microphones. Additionally, the same main operation system is being installed at CRCE for consistency and efficiency. This will eliminate and simplify staff processes for better training and consistency. Budget: $207,000 Timeline: May – July 2017 Areas at ARC, CRCE, and Ice Arena were in need of touch up painting due to wear and tear of the facilities. ARC was last painted when the facility opened in 2008. Adding scuff lines to help with wear and tear of facilities in high use and damage areas. These facilities average 5,000 users a day plus all of our special events traffic. Budget: $781,000 Timeline: April-June 2017 The fencing at the Complex Fields was over 30 years old and had served its purpose from a life expectancy standpoint. The 6′ fence was easy to climb, pulled apart, and started breaking down in many areas. This no longer provided security for outdoor field patrons. An 8′ chain link fence was installed and extended in areas for safety as well as reinforced in high traffic areas. The new fence is safer for individuals driving on roads as well as patrons and other athletes playing on fields. The fencing at the Outdoor Center Playfields was also replaced. The south fencing was over 13 years old and the north fencing was over 20 years old. The 6′ fence was broken down in areas not providing security. The fencing was replaced with an 8 foot Centurian Ornamental Steel Fence for better protection and is not suited to climb over. Budget: $782,000 Timeline: May 15-July 1 The South Turf Fields showed signs of tremendous wear making them unsafe to play on. More community members were using the fields than originally planned for. The fence was not secured to keep people out. With a lack of maintenance, knowledge, and the correct equipment, these fields were not able to keep up. The turf is being replaced with the same turf that is on the north fields and additional equipment has been purchased to maintain upkeep on the fields to increase field life expectancy. Budget: $185,000 Timeline: Summer 2017 The CRCE lockers are being replaced with more durable lockers that are similar to the lockers we have at the ARC. The original type used is not conducive to environment holding water and humidity. Locks on day use lockers will be replaced throughout the building. All day-use lockers at the ARC will have the same locks on them. We currently have 3 different brands of locks that require different keys and two of the manufactures are out of business. We elected to replace all day use lockers with same locks for consistency and training efficiency. Budget: Timeline: Information coming soon. Budget: Timeline: May 9 – June 6, 2016 Resurfaced gym floor. Previous floor was 9 years old showing considerable wear and tear. The painting and application of sealant had dents. The floors were sanded down and new application put on. Budget: Timeline: May 9 – June 6, 2016 Resurfaced gym floor. Previous floor was 9 years old showing considerable wear and tear and a bad finish. The painting and application of sealant had dents. The floors were sanded down and new application put on. ARC, CRCE and Ice Arena AED machines. Budget: $18,000 Timeline: Upgraded all AED machines and added more. Machines were added to barns area where maintenance and grounds equipment is housed. The Outdoor Center Playfields received an AED unit where BNAACC is leasing office space. Budget: Timeline: Closed May 16 – August 15 while the inner floor of the pool is replaced with a better surface. CRCE Pool Liner Replacement – Total Expenditure – $121,007.72. CRCE pool was a tile based pool that had a problem of tiles breaking off, which lead to repeated work being done on the pool, loss of revenue and programing time. The pool was replaced with different surface that doesn’t have tile and is easier to manage. Removed volcano due to safety issues and better visibility. Budget: $223,000 Timeline: Carpet had reached its life expectancy and was showing wear and starting to fray. Carpet – main level and upper level. The desks took up a large amount of space on the upper and basement and only a portion of the desks were used. Demoed and recycled the wood to make smaller desk and work stations. More usable space for patrons. Budget: $70,700 Timeline: Windows were not energy efficient and were the original windows from when the facility was built in 1971. New 2 ply windows were installed. These are energy efficient and have a reflective coating to control temperature. View on-line or use the free app! Campus Recreation makes every effort to be accessible to all abilities. If you need special accommodations for this facility and/or program, please contact us at campusrec@illinois.edu or provide your Accessibility feedback online. Campus Recreation encourages you to report any acts of intolerance.